A few weeks ago we presented you the first and second article in a series of articles that will treat the genesis of the 1988 album “Barelli in bruisend Brussel”. The assistant of Bob De Moor for that album was Geert De Sutter, who took care of the background/decors in the album. Since both men only had a few months to complete the album they had to work rather fast. To get the work done in such a short time, Geert De Sutter decided to get himself a Polaroid camera and use that to sketch the decors. The 15th page in the “Barelli in Bruisend Brussel” album. Today we will handle a detail from page 15 and more precisely the 3rd case on the page. 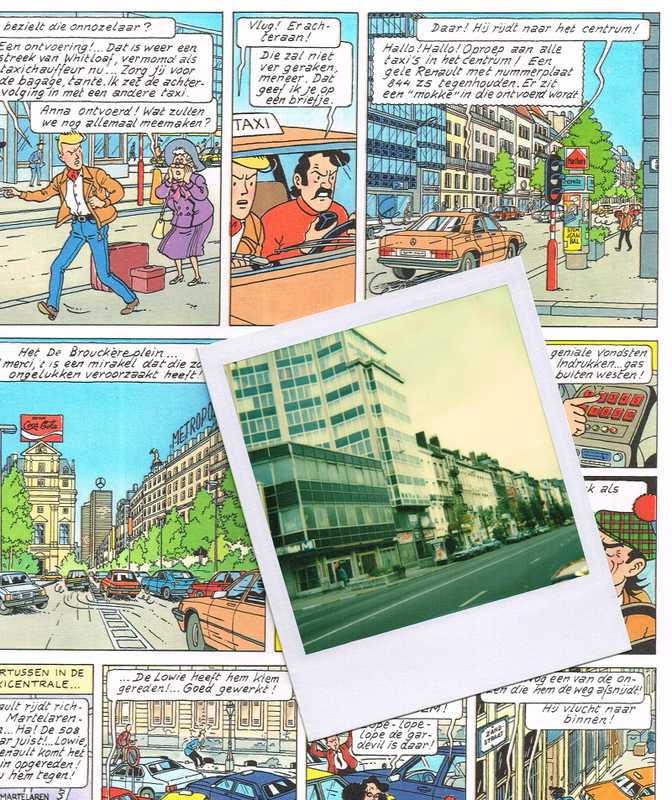 The metro station entry has in the meantime changed, and despite going through Google Street View (the Anspach Avenue) we haven’t been able to locate the current spot (and Geert De Sutter couldn’t really remember, after all it’s more than 27 years ago). If you know where this picture was taken, let us know. 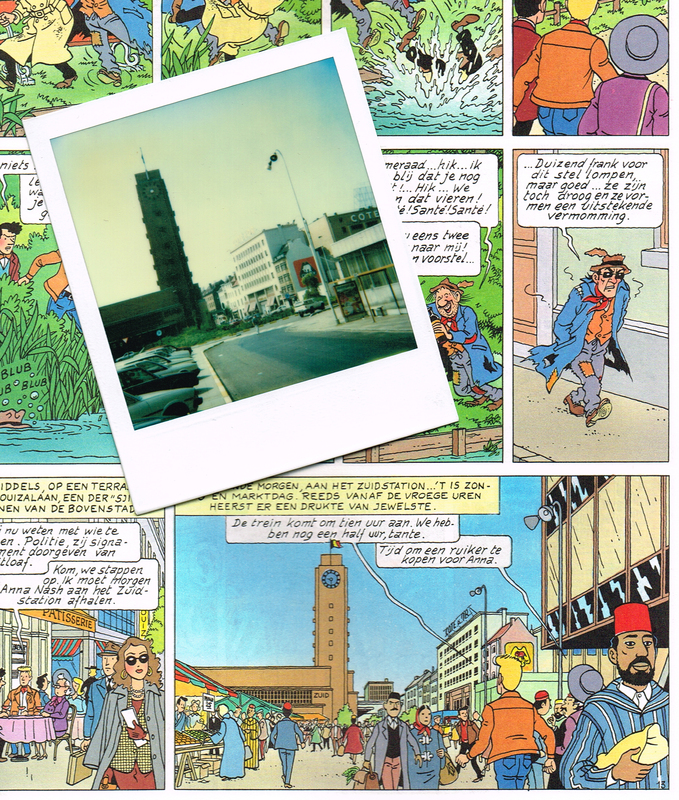 The middle strip of the 15th page in the “Barelli in Bruisend Brussel” album. Bob De Moor already inked the characters. The 3rd case in which the polaroid was used as documentation has an interesting detail, the traffic light. The colourist actually made a small error. If you look well, you’ll see that the traffic light has the red light in the lowest position whereas it should be placed in the highest position. Colourist for the album was Hanelore Vantieghem, we tried reaching her for some feedback on her overall work on the album but to no availability so far. We also present you the 2nd strip from that page which is already partially inked (by Bob De Moor), Geert De Sutter would then ink the decors and send the page back. We are able showing you this because Geert De Sutter took scans of each step of the working procedure. A few days ago we presented you the first article in a series of articles that will treat the genesis of the 1988 album “Barelli in bruisend Brussel”. The assistant of Bob De Moor for that album was Geert De Sutter, who took care of the background/decors in the album. Since both men only had a few months to complete the album they had to work rather fast. To get the work done in such a short time, Geert De Sutter decided to get himself a Polaroid camera and use that to sketch the decors. The Polaroid picture used to draw the last case on page 13 of the album. Here’s how it went. First Bob De Moor sent him his sketched pages after which Geert went into town (he lived in Drogenbos then, a municipality located in the Belgian province of Flemish Brabant) to take the necessary pictures and start work on the decors the same day. The Polaroid example we show you today comes from page 13 of the “Barelli in bruisend Brussel” album and represents the clock tower of the Brussels-South railway station (don’t mistake with the Tour du Midi). It’s one of 2, another clock tower can be seen at the North railway station. This clock tower was demolished when the railway station underwent a complete relook a few years later for the arrival of the TGV. Not that the station is a beauty nowadays, it has earned several nominations for worst railway station worldwide, due to the very high criminality and the not so clean reputation overall. 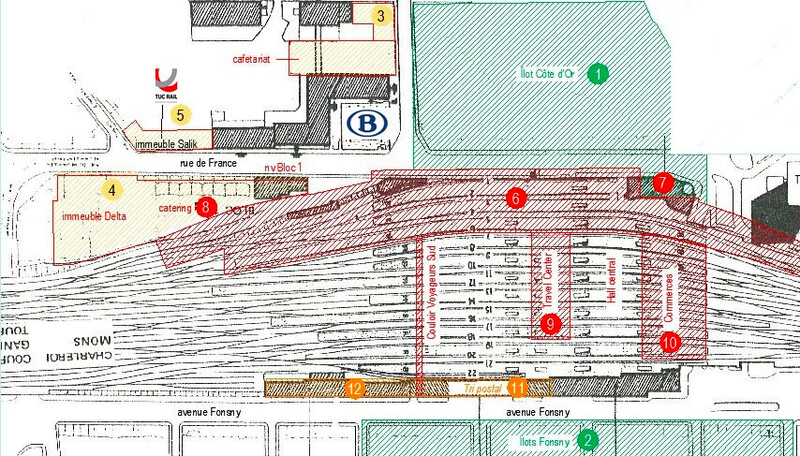 A before and after for the Brussels-South railway station area. Click to get a bigger picture. 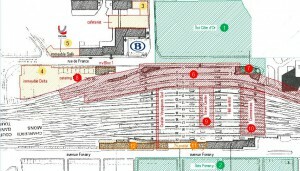 To get an idea where the tower was located you should stand in front of the Pullman Brussels Centre Gare du Midi hotel which was inaugurated in the summer of 2013 (see also the map on the left, the number 7 indicates where the clock tower stood). 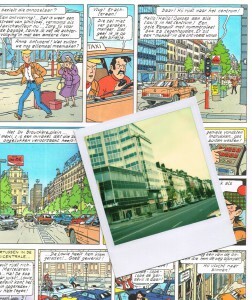 On the Polaroid picture you can equally see the Côte D’Or building on the right of the tower (with the elephant), this was also included in the drawing for the Barelli album. This building was – surprise surprise – also demolished later on when the TGV arrived in Brussels. All in all it’s quite interesting that this album features historical documentation which people visiting Brussels nowadays won’t find back due to an inflated urbanism which has overrun Brussels and left quite some scars in the city. 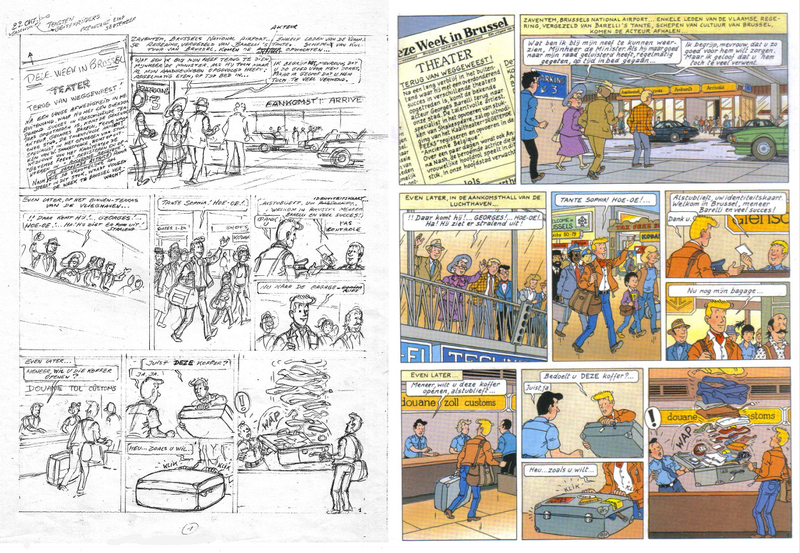 Geert De Sutter sent us a few scanned pages of the preliminary sketches Bob De Moor made. The scans exist because Bob De Moor always asked that Geert De Sutter would make A3 copies of the sketches before to start working on them. The page we show you today is the first page of the “Barelli in bruisend Brussel” album. The initial sketched page is on the left, the final version is on the right. Click to see the bigger version. The first thing you’ll notice is that the story is originally written in Dutch unlike the other Barelli albums which were originally written in French (and often not well translated into Dutch). The page composition is already complete and also the characters are all placed on the page. The decors are not worked out, that will be the job for Geert De Sutter. There are a few things though that have changed. In the first frame you see that Bob De Moor added an arrow to move the newspaper article up because the text that he wanted to add would never fit correctly in the frame. Note also that Anne Nannah is called Anna Nash here. The text itself in the news article is more or less the same although you’ll see a progressive spelling for the word ‘theater’; Bob De Moor uses ‘teater’, without the ‘h’. 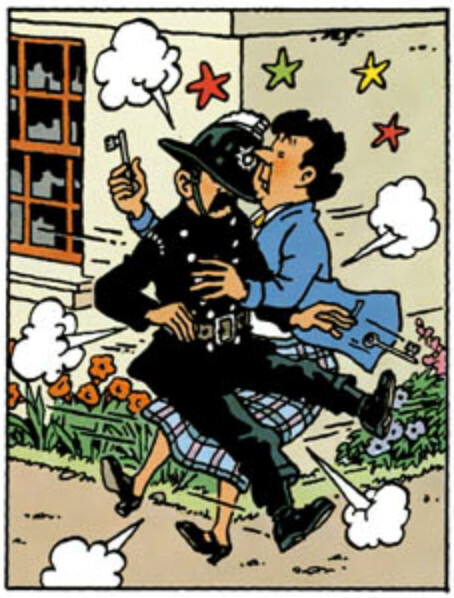 You also see this in the second frame where De Moor is again using the more progressive spelling, this time for the word ‘acteur’ (actor in English); he uses ‘akteur’ with a ‘k’. Note also that he had it replaced by ‘artiest’ but then reused the word ‘akteur’. The rest of the page holds nu differences, except for the last 2 frames. You’ll see that the stickers weren’t added originally and that the objects jumping out of the luggage are a bit more diverse in the final version. Also interesting is the text written in the left upper corner of the page. You can see the following text written by Bob De Moor: “22 Okt. verschijnt teksten geitenrijders reportage eind september”. The text itself is not really grammatically correct but it’s an interesting note, because De Moor refers to “De geitenrijders” which was the original name of the 1956 album in the Snoe & Snolleke series. The album would indeed be published in 1989, a year after this note was added via Casterman but under the title “De zondebokken”. Today we present you a detail which will very well explain how Bob De Moor and Geert De Sutter worked for creating the album “Barelli in bruisend Brussel” album. The detail was sent to us by Geert De Sutter a few weeks ago. The album itself originally was published in 1988 and reissued in 1989 and 1994. Originally commissioned by Hugo Weckx, the Community Secretary of Education / Public Health and Brussels Affairs, it was released in various languages. The detail we show you today has never been published before. 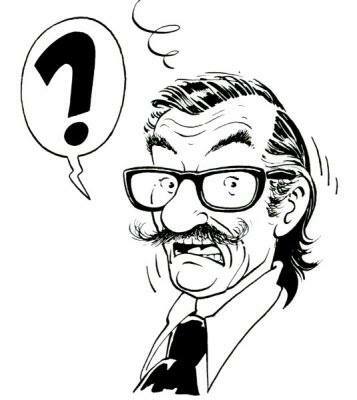 The strip was sketched out by Bob De Moor, after that Geert De Sutter worked on the decors while Bob De Moor drew the characters and also inked them. Afterwards Geert De Sutter inked the decors. The strip here shows the inked characters and the decors still penciled. The final inked results in black and white. 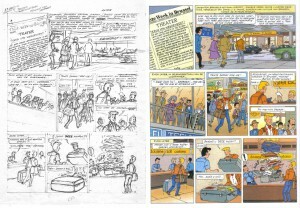 The final inked strip in black and white can be seen on the left. 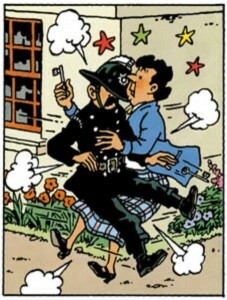 You’ll probably will have noticed that it shows the infamous moment when Bob De Moor is being ran over by Barelli in a typical corner accident which De Moor so often used, see for instance also this Blake and Mortimer frame which was published in the first and second edition of the Blake and Mortimer album “Professor Sató’s Three Formulae, Volume 2: Mortimer vs. Mortimer”. 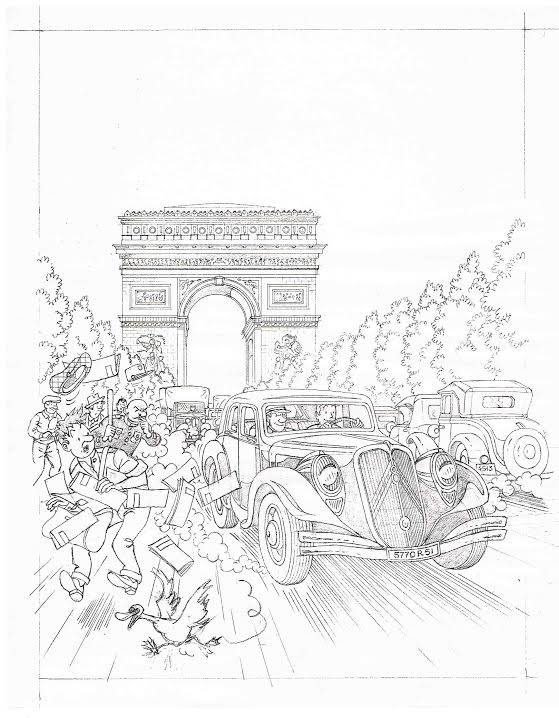 In the past few months we dedicated 2 articles to the cover drawing which Bob De Moor completed in August 1992 for the 1994 publication “La 22, Enquête sur une mystérieuse Citroën”. The book, written by Hervé Laronde and Fabien Sabatès and published via the French publisher Rétroviseur, features the very last drawing Bob De Moor would complete before succumbing to cancer in August 1992. That this is indeed the last drawing he would make had been confirmed by De Moor’s wife Jeanne De Belder. A few days ago Geert De Sutter, who has assisted Bob De Moor on several (new and re-published) albums, sent us a scan of the pencil drawing of this cover and he also told us how Bob De Moor and he worked together to complete this cover artwork. 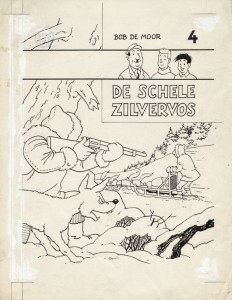 Bob De Moor made a rough sketch of what he wanted on the cover after which Geert De Sutter started drawing the actual cover. It was however Bob De Moor himself who inked the drawing and as it seems he didn’t change any detail during this procedure as Geert De Sutter also confirms (see also page 386 of the Bob De Moor biography by Ronald Grossey where this particular drawing has been referenced). The documentation of Bob De Moor for the Citroën cover. 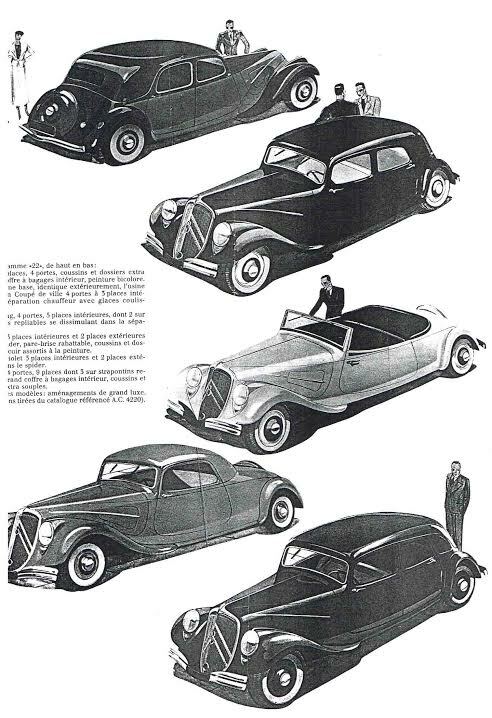 Geert also provided us with a scan of the documentation which Bob De Moor had sent him in order to draw the Citroën. You can see this original reference material on the left. You’ll notice that the original source material used was quite old (it was a very old model after all). With this 3rd article we have been able to show you the complete genesis of this particular Citroën drawing. We have several other such examples which will show you bit by bit. Thanks to Geert De Sutter for the material provided. 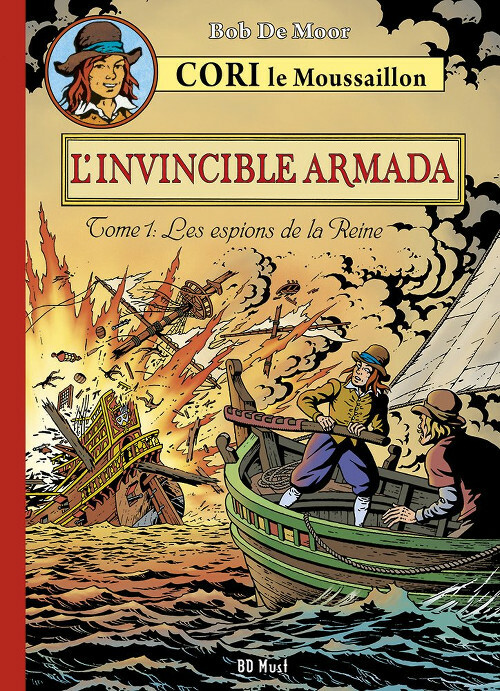 From 1977 (starting on 22/11/1977) to 1978 Bob De Moor saw his reboot of the Cori saga, “L’Invincible Armada – Les Espions de la Reine”, published in Nouveau Tintin, Eppo, Junior, … The cover used to announce this brilliant first part of the rebooted Cori saga on the first glance looks exactly the same as the one used for the album version to be published in 1978 by Casterman. 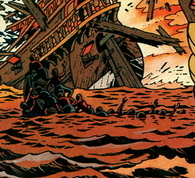 The detail which Bob De Moor cleaned out in the final album cover. But Bob De Moor changed a detail that not everyone noticed at the time (and still now a lot are not aware of it). He removed the part where several drowning men are trying to hoist themselves in a dinghy. Bob De Moor didn’t only change the cover. When the story was pre-published in the Dutch magazine Eppo, he also removed a few lines representing vertical reef ropes because those didn’t exist when the Armada, the Spanish fleet that sailed against England in 1588, existed. The corrected version by Bob De Moor as re-released by BD Must. The recently released Cori album set by BD Must holds the corrected version, that is without the drowning men. In case you have not ordered this re-release, you’d better be fast, only 1000 were made. You can still order yours straight from BD Must. 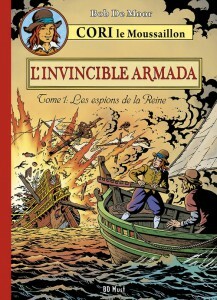 “L’Invincible Armada – Les Espions de la Reine” was welcomed as the comeback or revival of Bob De Moor after years of working for the Studio Hergé and it paved the way for more Cori albums. 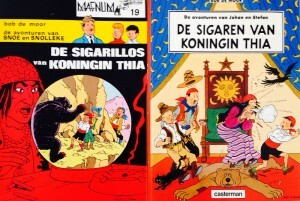 On the right the Casterman version from 1989, on the left the Magnum series version from 1979. Today you’ll see a very good example of how an album in the Oncle Zigomar series got rewritten, renamed, partially redrawn, and a bit brutalized (for the dutch market?). Victim of today is the album “De sigarillo’s van Koningin Thia” (Eng: The cigarillos of Queen Thia) which was published from 26 March 26 1952 till 18 July 1952 in the newspaper De Nieuwe Gids and related titles. In 1956 the album “De schele zilvervos” (dutch for”The squint-eyed silver fox”) by Bob de Moor was released. This 4th album in the ‘Nonkel Zigomar, Snoe en Snolleke‘ series has a peculiar twist in the original cover artwork if you compare it to later editions. In the very first artwork (which you can see on the left) you see a fox next to the gunman. In a later version that fox would be replaced by a real squint-eyed fox – the animal also appeared as such in the album. 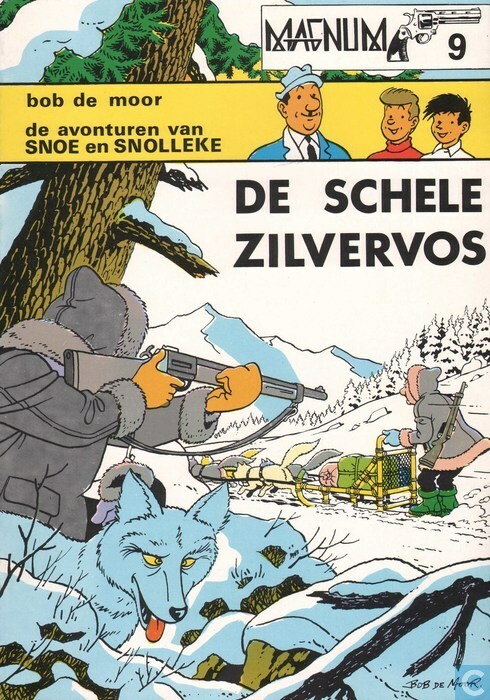 De Moor completely redrew the cover adding more details to the sleigh and to the equipment of both the gunman and Uncle Zigomar. Note that the later versions saw the dutch tekst rewritten (with less Antwerp-flemish) too. Luckily enough the adaptation kept the flemish character (with a humor that was quite like the one from Willy Vandersteen) very alive. 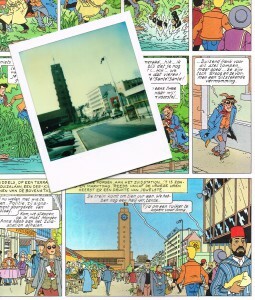 Next to this the pages also underwent a facelift as de Moor was well aware that the stories were from his hectic period when he was working both at the Hergé Studios and also still delivering strips for the daily ‘Nieuws van de dag’. 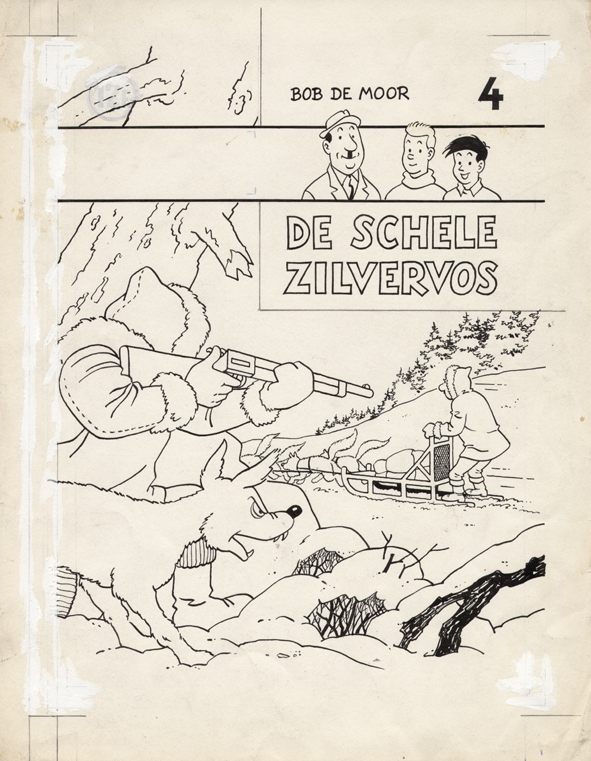 The biography “De klare lijn en de golven” (order here) learns us that Bob de Moor found an assistent, Geert de Sutter, who reworked the pages re-drawing the text balloons (which in the original versions were quite irregular), he also removed the shadow silhouettes in the foreground and replaced them by line drawings. The albums were then published in color by Casterman and Standaard Uitgeverij. Also noticeable, in the early days the series was called ‘Nonkel Zigomar, Snoe en Snolleke’ whereas later on it would be renamed as ‘Snoe en Snolleke’ and even later would be completely rebranded as ‘Johan en Stefan’ in 1987 (not coincidently the names of 2 of Bob de Moor sons though they never were asked if they were ok with it so it seems).